I’ve read a couple of reviews of this book recently and it sounds like such a good read so I treated myself to it. I hope to read it very soon. This is another book that I discovered through blog reviews and I can’t wait to read it. I really enjoyed Kelly’s previous novel and so this was a must buy for me! I was thrilled to get the chance to read and review this for Corvus books. I love Rosie Blake’s novels, especially her Christmas one, so I can’t wait to read this one. I just know I’ll love it! I requested this one NetGalley a little while ago but had forgotten about it so when I got the approval email this week I was really pleased. This book definitely won’t be on my TBR pile for very long because I’m so keen to read it! I was offered the chance to review this book and I couldn’t accept quick enough, it sounds like a brilliant read and I plan to read it soon! I was offered this book for review this week too and it was another one that I absolutely couldn’t say no too, it sounds like such a great read and I hope to read it very soon! This was a book I spotted on Net Galley when I logged on to give feedback for another book and I couldn’t resist hitting request! I’m reading it now and enjoying it so far. I’m going to be on the blog tour for this book so plan on reading it soon so I can review it on my date. I’m looking forward to starting it in the next week or so. I was also thrilled to win a signed copy of These Days of Ours by Juliet Ashton recently and it arrived in the post yesterday. This entry was posted in Books, ebooks, Stacking the Shelves and tagged Alison Umminger, Amanda Saint, Books, ebooks, Emma Cline, Isabel Costello, Jennifer L. Armantrout, Juliet Ashton, Karen Long, Kelly Rimmer, Rosie Blake, Sue Wallman. Bookmark the permalink. I haven’t bought any new books for me this week but I did buy some for my nan for her birthday. I also received the Rosie Blake book in the post and my carol Matthew books that I won along with a signed children’s book for my daughter. I’d love to read The Girls. It’s definitely going on my birthday book list! 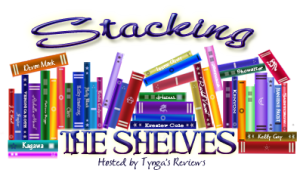 Your Stacking The Shelves is always bad for my TBR! 😉 I bought Schtum this week on your recommendation! Really! Are there meetings I can go to to help curb this addiction? So lucky to get the Problem with Forever. I hope you love all of your new books. Oh, these look really good! I have a copy of The Girls, and hope to read it soon. I’m eyeing My Favorite Manson Girl. Enjoy! Thanks for sharing. I was very lucky this week to receive a signed copy of 183 Times A Year by Eva Jordan and A Dictionary of Mutual Understanding by Jackie Coplegon. Both are new authors to me and I look forward to reading and reviewing. I also downloaded a copy of John’s Marrs The Wronged Sons. I really enjoyed Welcome to Wherever You Are and looking forward to this to. Hi I tried finding you on Twitter but can’t find you please can you give me your name on there. I’m I following you? What is your user name? I was curious so I read the blurb for As If I Were A River. This sounds like a very good read. In fact, most of those books might end up on my TBR, as usual with your picks! Great books! I’ve added a lot of books to my shelves this week. One of them is Lying About Last Summer. I can’t wait to read that one. I can’t wait to read Lying About Last Summer either, it sounds like such a fab read. I hope you enjoy it when you read it. Wow, this is impressive. That’s a lot of books to buy or get in a week, let alone read them all. Then if you review them on top of that, you are a machine! Would you like to do a blog post for my blog about how you accomplish that, and why you started reviewing books in the first place? Yes, I will email you. Thanks so much.